Seriously under the weather today, fever, etc. so I’m taking it easy. Partner/Spouse took care of dinner and started yesterday! I don’t recall if I said anything, but for the past couple of weeks, my BiL has been working hard in their back yard pouring cement slabs, prepping for said pour, etc. He’s been exhausted at the end of the day so we’ve taken over cooking for the two households for the time being. So we’ve been cooking for 8 people instead of three. Understandably, we’ve been doing the easy things, soups, stews, etc. So yesterday, Partner/Spouse picks up a three pound 7Blade roast and puts it in the crock pot on low with several jalapeno peppers. That sucker cooked all night long, and all day long. I stayed in bed listening to my stomach growl. When he deemed it was ready, he took the meat out and shredded it by hand. He removed the peppers that had been cooking for so long but left the rest of the spices and herbs. He roasted several more jalapenos on the grill and chopped them into the shredded meat. After that, it was standard stuff. 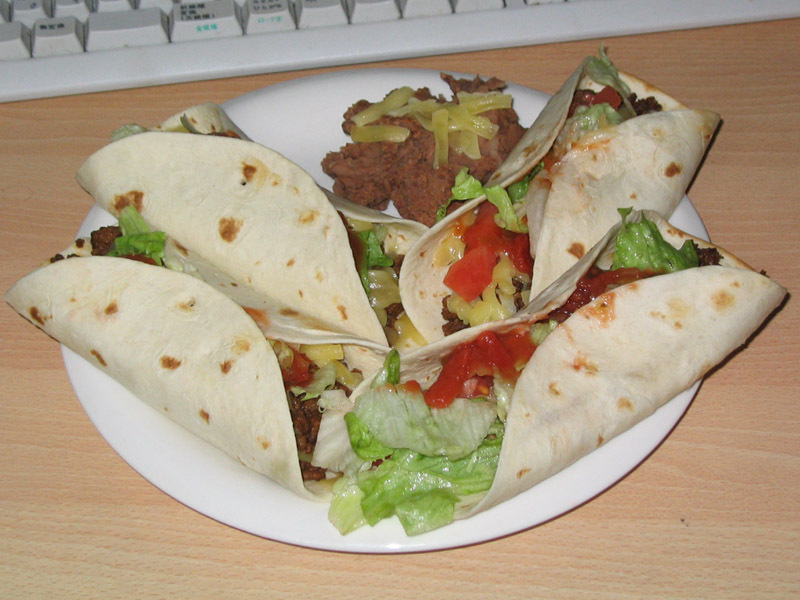 Cans of refried beans, boxed mix of Spanish Rice, corn tortillas fried either flat or folded. We had picked up the tortillas at the tortilla factory this morning so they were about as fresh as could be. And we had also picked up fresh pico de gallo at the mercado this morning so the ingredients were about as fresh as we could get. There aren’t any left. None. I wasn’t there but the eye witness reports claim there was a feeding frenzy. I ate a couple here at home on small soft flour tortillas. Totally good! Okay, the final (for now) post about bread. I’m sure you’re getting bored of it, right? The final two types of bread I want to talk about are quick breads, and breakfast breads. Both are breads in the sense that they have wheat flour as the main ingredient and use a dough as a base, but there is no rising or proofing time, and yeast is not the rising agent. In most cases, the rising agent is chemical based in the form of baking powder or baking soda. Quick breads fall into two categories. The first is the most familiar, the fruit or vegetable breads. How many have had banana bread? How about zucchini bread? How about pumpkin bread, or citrus bread or walnut bread, or spice bread? Corn bread? Ever heard of it? 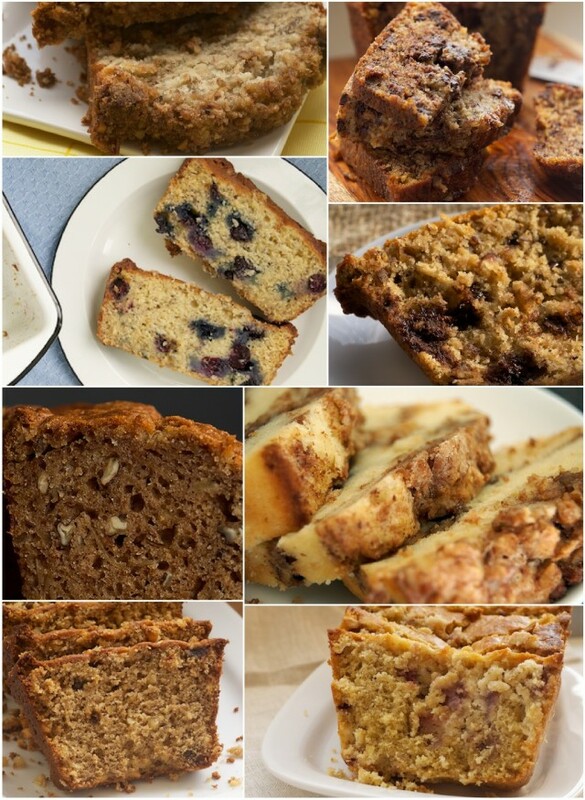 These are all examples of quick breads that use the same basic recipe with modifications to make it a specific kind of bread. 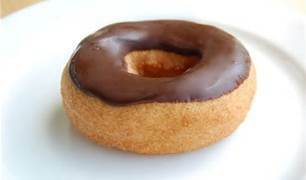 The leavening is usually a one of two things. Baking powder is a dual action. As soon as it gets wet, it starts the rising action, then stops. Later, when it gets heated, it rises again give the bread extra oomph. Baking soda gives quick bread it’s rise by combining it with an acid. 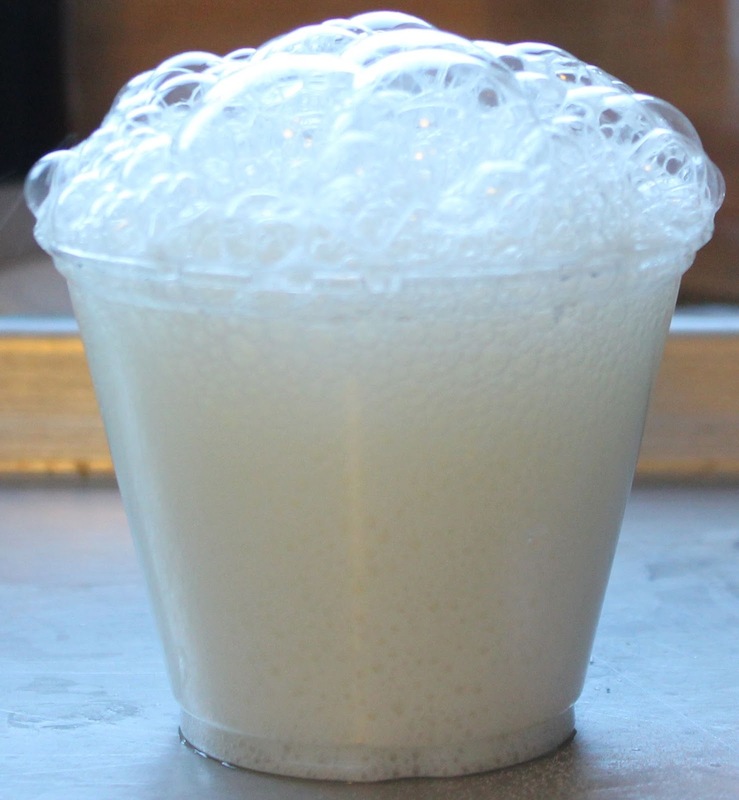 When the soda and acid meet, they form bubbles. Who hasn’t seen the reaction of vinegar and baking soda? You mix a small amount of baking soda with the dry ingredients, then add an acid with the wet ingredients. Usually it’s a small amount of vinegar, lemon juice, but most typical is buttermilk. 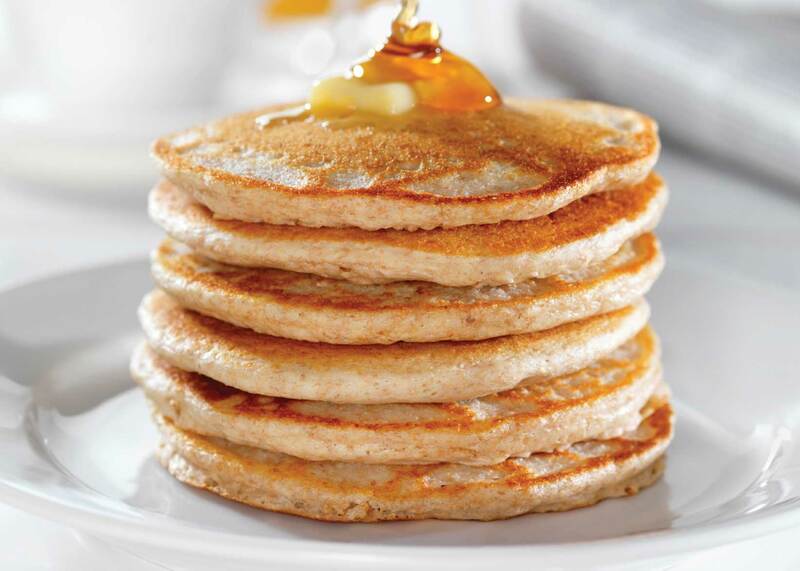 Buttermilk not only adds flavor, but gives the acid necessary to react. One type of quick bread we all know and love is just a different method of baking. Muffins! Who doesn’t love a chocolate chip, or a blueberry muffin? I used to make a cranberry spice muffin that was real good. The only difference between a loaf of quick bread and a muffin is what you bake them in. Not all quick breads are sweet, although they tend to be so. Corn bread can be sweet or savory. I’ve made corn bread with cheddar cheese and jalapeno peppers in it. Another quick bread that is not a sugar based bread. Irish Soda bread is a standard at my house, and across the ocean in Ireland. Soda bread can be made with plain AP flour, or can be dressed up to add flavors and depth. 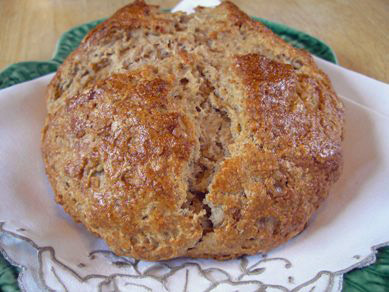 Honey Oat Soda bread is a very popular variety all over the world. Breakfast breads tend to run on the sweet side, or if not, made sweet with the addition of jams, jellies, honey, or syrup. Muffins, donuts (mmm donuts! 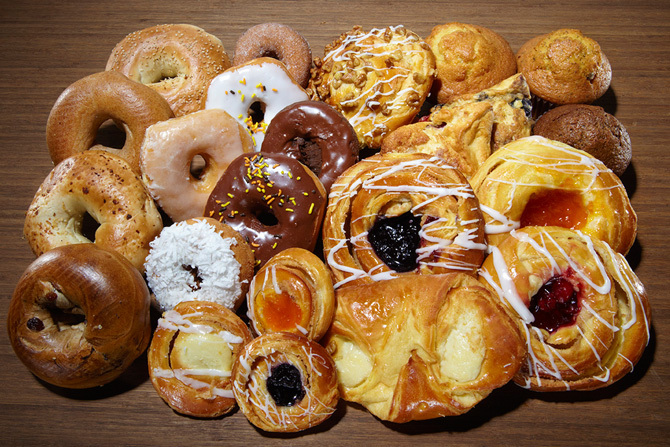 ), bagels, danishes are good examples of breakfast breads. Nearly all of these are the yeast variety, and nearly all use the standard flour dough. But the variations in the dough process make these so different and so delicious. Danishes, for instance, are flaky due to the rolling out, kneading, rerolling process. Jams, preserves, or sweetened cheese are used to fill the pastry. Bagels are boiled in water laden with baking soda before they’re baked to give them the soft but chewy crust they’re known for. 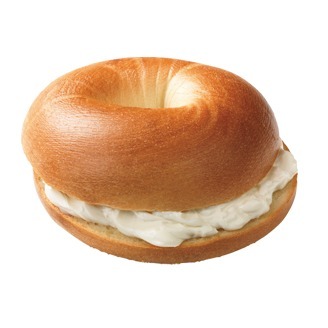 I came to bagels pretty late in life, on an airplane. Loved ’em ever since. But another type of breakfast bread is made from a batter rather than a dough. Partner/Spouse loves these. I’m not a big fan, although I’ll eat them occasionally. 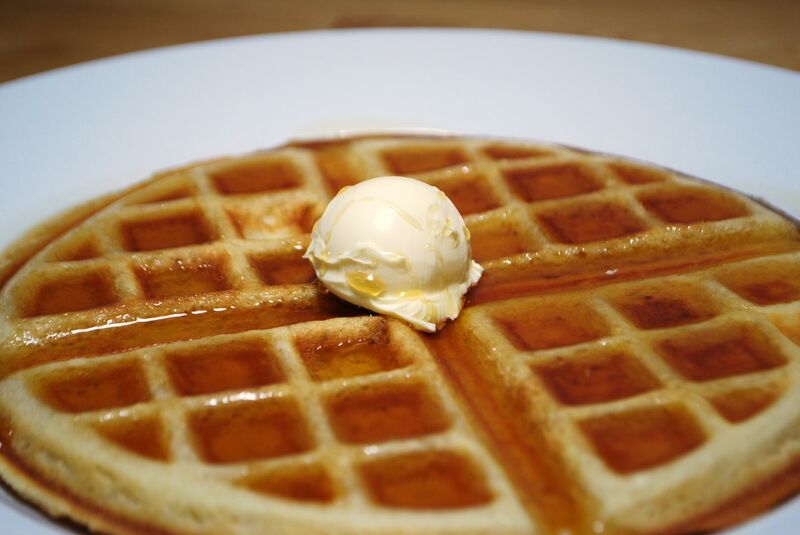 They’re made from the same batter, although the waffles use a lighter consistency batter than the pancakes. And they are both just as versatile as any bread. I’ve made some very dense pancakes, spread them with mashed banana, rolled them up, and taken them to work for a quick breakfast at my desk. I added oatmeal to the batter to give them some depth. I’m going to leave you with an easy and pretty good banana nut chip bread recipe. Hope you liked this series of posts. Enjoy! Preheat the oven to 350. Cream the butter and sugar together. Add eggs and bananas and mix well. Add all other ingredients and mix until just combined. Pour into a prepare loaf pan. Bake one hour to one hour and ten minutes. Cool and eat. OOOOOPPPSS!!!! I don’t know what happened to me yesterday, apart from being busy. I completely forgot it was Wednesday, a blog post day. So here it is today, with the last one coming in tomorrow. Specialty breads are those that fall just outside the realm of regular breads. Shaped breads, enriched breads, flat breads are all good examples of these. Shaped breads are just like they sound. You take an ordinary batch of dough and shape it into something. In the picture above there are two rings of different types, a pebbled round loaf, and a wheat stalk. 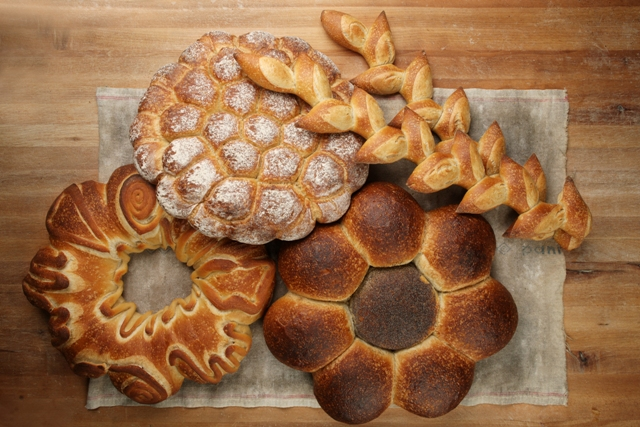 Some of the shapes are basic, like a braided challah, or artistic like a sheaf of wheat. Long and sturdy, it’s not made to last. 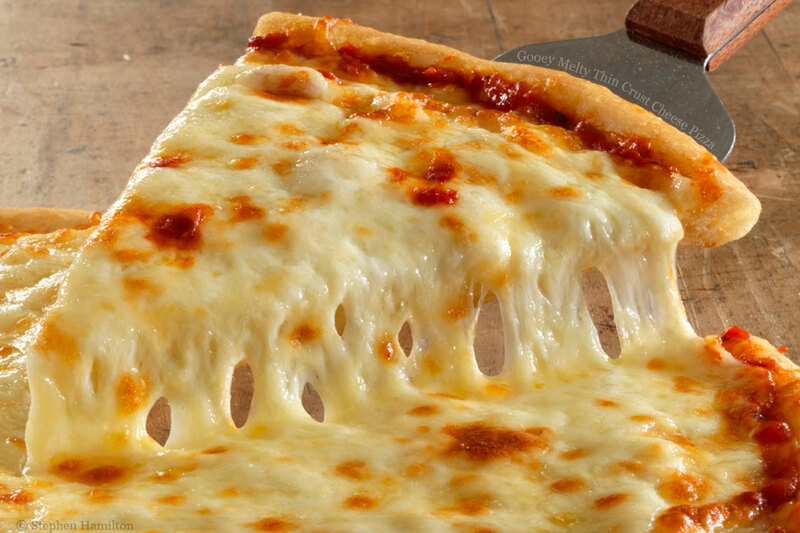 Buy it fresh and eat the whole thing immediately. It will very quickly dry out and turn to a brick. Of course, the french never waste anything so if a loaf has reached that point, it becomes croutons for salad or placed in a bowl of french onion soup. Enriched breads are those that start with the basic dough, but things are added to it. The dough is enriched with added ingredients. These ingredients are typically added just before the final rise. In the U.S., the best known example is cinnamon raisin bread. Another good example is the Hawaiian loaf, one that is sweetened slightly with the addition of pineapple juice. 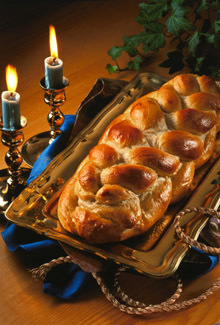 Worldwide, the best known example of an enriched bread is challah. Honey and eggs are added to the dough to give it its signature sweet richness. Many times various seeds are added as a topping. 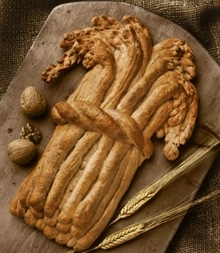 It once was a feast day bread only, but its popularity moved it into the realm of a special everyday bread. 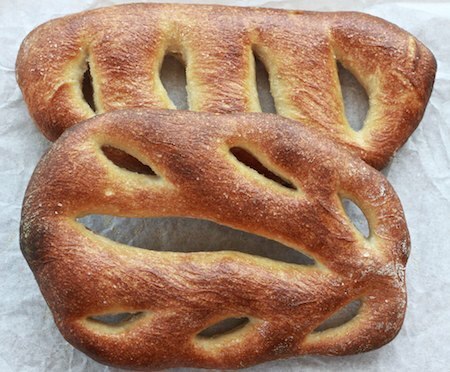 It’s shaped in a simple braid, baked, and is wonderful stuff. Every culture has their own version of a flat bread. Flat breads use no leavening, or rising, agent at all, relying on heat to create steam to give the dough its lift. Because of this, the bread stays flatter than normal. Corn and flour tortillas are excellent examples of flat bread. And excellent tasting, too! Don’t get me started on those. 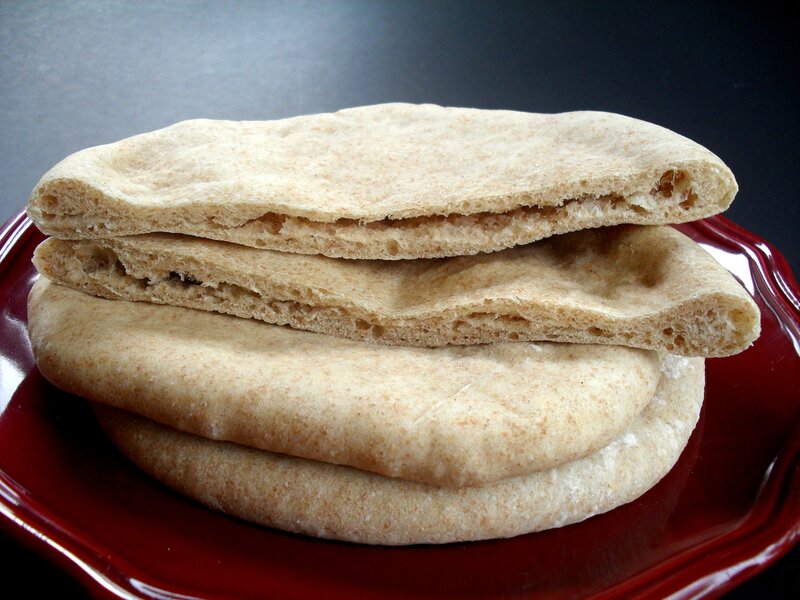 Pita bread, or pocket bread, is another well known example. The dough is shaped into discs about five or six inches round and placed in an extremely hot oven, over 500 degrees. They’re cooked quickly, and in the process, the steam in the dough causes them to balloon into a sphere. As they cool, they flatten, but the pocket remains. When cut in half, the bread is easily separated so filling it with anything becomes a matter of just spooning it in. 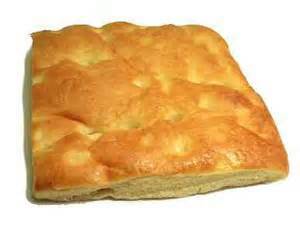 Another well known example of a flat bread is focaccia, an Italian flat bread that’s as versatile as it is delicious. It can be eaten by itself or made into sandwiches and is one of the easiest breads I’ve ever made. I’ll share the recipe soon. It’s surface has a signature dimpled look place purposefully by the baker to help hold any oil or sauce spread on the bread. Don’t get me started. Love the stuff! 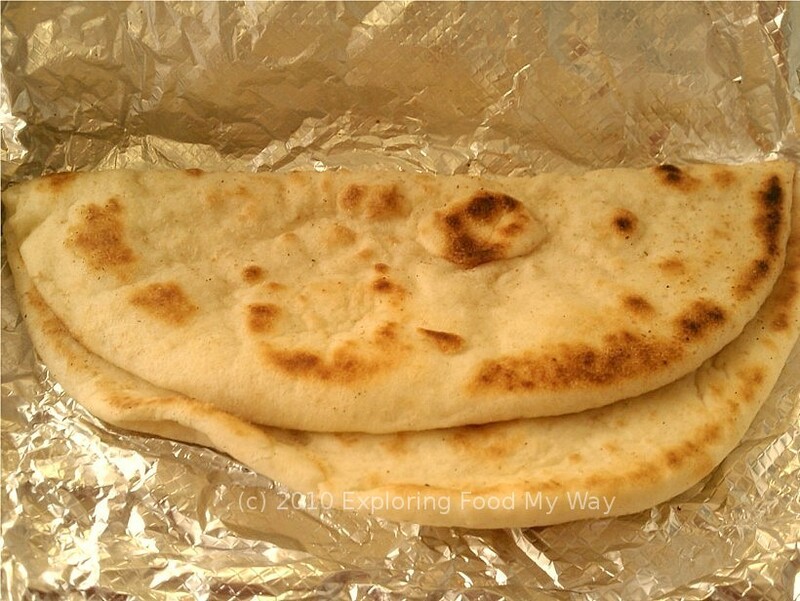 Another flat bread that’s less well known is called Naan. It’s Indian, so if you’ve ever been to an Indian restaurant, you’ve probably had it. My favorite way to have it is to spread it lightly with olive oil and grill it until it’s toasted. Then I just cram it into my mouth as fast as I can. 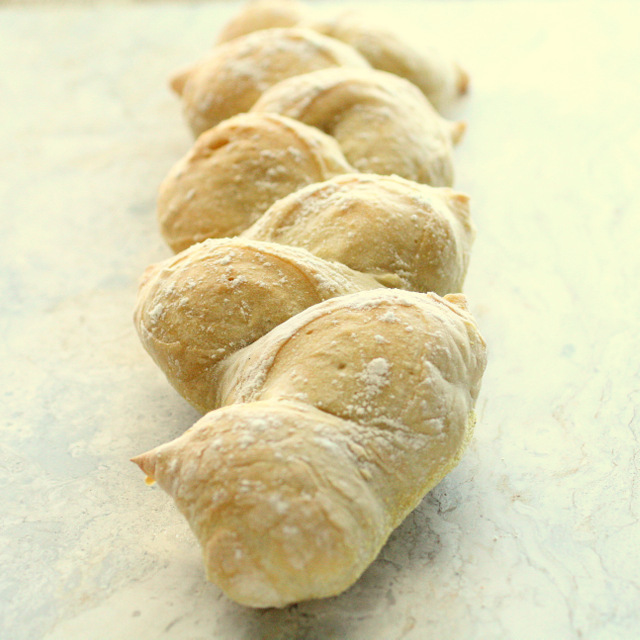 I’m going to leave you with a recipe and history of one of my favorite enriched breads. 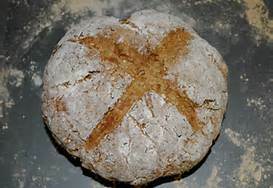 It was one of the first breads I learned to make. It’s called Sally Lunn bread. Sally Lunn bread and buns got its start in Bath, England in the late 1600’s when a young refugee from France started making the enriched bread. It uses warm milk, eggs, butter, and sugar to make a wonderful rich bread that is now highly prized throughout the world. From Bath, it traveled to colonial America and was sought after, particularly in Williamsburg, VA, where it’s still a feature on the menu at several historic restaurants. It’s remarkably easy to make. Use a bundt pan or an angel food cake pan. Put yeast in warm milk (not over 108 degrees). Cream together 1/2 cup butter and 1/3 cup sugar. Add 3 eggs and beat well.Sift in 4 cups flour alternately with milk and yeast mixture, beating well. Let rise in a warm place, then beat well. Pour into well greased Sally Lunn pan (can use bundt pan) or muffin pans. Let rise again before baking in a moderate oven. Nope, not the music group from the 70’s and 80s’s. We’re going to be talking about the stuff you eat made of flour, water, and yeast. Those are the basic ingredients. It all starts from there. I’m always a little surprised at how intimidating bread-making is. I hear it all the time, how people are scared to bake bread. I can understand why in some respects, but the easiest way to get past the uneasiness is to just make the bread. If it doesn’t turn out right, who cares? It’ll still taste good. Then you try again until you get it right. No one is born knowing how to do this stuff. It just takes practice. One of the things that makes some cooks shy away from making bread is the time it takes. It can take several hours and that’s quite a commitment to something that might not work. There are different kinds of breads that take significantly less time, and those have a place in the bread pantheon. But when most people think of bread, they think of the loaf that can be sliced and used for sandwiches. It has a firm texture, few holes, and a good taste. Recently, bread making machines have been on the market to simplify the process. You throw your ingredients in the correct order, set the machine, and three or four hours later you come back and take out a perfect loaf of bread. 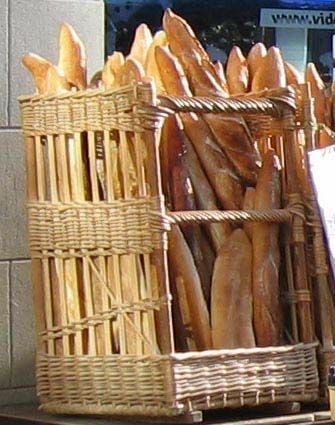 Initially, these machines made tall loafs that looked more like tubes than a standard loaf. However, changes have been made to the technology involved and many of them make the standard loaf shape and size. Prices have dropped considerably, too, but don’t buy on the cheap if you’re going to invest in one. I use mine continually and have been through almost a half dozen of them. I’ve also made bread by hand, mixing, kneading, etc. and have come up with some superlative loaves, and some real duds. It’s hard not to be discouraged when the ambient humidity can affect the finished product. That’s where practice and experience comes in. There are loads of different kinds of bread. There are the basic yeast bread that require rising, or “proofing”, times. Depending on how tasty you want them, you may need to let them rise a couple of times. These require the biggest outlay of time, but have the smoothest texture. The there’s the “artisan” breads which are yeast breads but made more roughly, and shaped into other forms. These are known by the large holes inside the bread, and the thicker crusts. Quick breads are breads made without yeast and the baking time is also the rising time. This category is typified by cornbread and banana bred style loaves. There are also breakfast breads, things like muffins, scones, buns, biscuits, etc. Buns, rolls, and biscuits could also be another category, or sub category. Cinnamon rolls would fall here. Finally, there are flat breads, breads made with no rising agent at all. There are as many of these kinds of breads as there are countries and cultures on the planet. Some of the better known are tortillas from Mexico, Naan from India, and pita bread, or pocket bread, from the middle East. I’ll talk today about the basic loaf of white bread and how to do it successfully by hand. Later in the week, I’ll talk about the specialty breads, then finish up with the sweet breads. Like I’ve said before, bread is just flour, water, and yeast mixed together properly then baked. Sounds simple, but it’s really not. First, you want to use the right kind of flour. 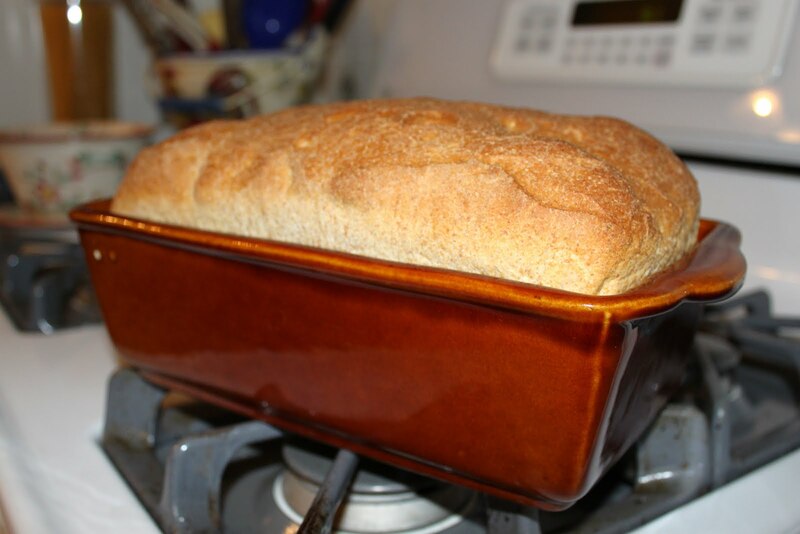 The thing that gives bread its texture and personality is created when water hits flour. It’s called gluten, and it’s the protein strands that give the finished product its shape and strength. It’s the thing that people who are allergic to wheat flour are actually allergic to. I’ve written about gluten free diets here before so I won’t go into that. But gluten is formed and reformed during the rising and kneading processes and is critical to a good loaf. Some flours have a higher concentration of protein to form gluten. You make have heard of bread flour, or cake flour, or all purpose (AP) flour. Second, you want to be certain that the water is the right temperature so it doesn’t kill the yeast. If the water feels slightly warmer than your skin, it’s about the right temp. Third, you want to be certain you have the right kind of yeast and that it isn’t dead. Most of the time, storing yeast in the fridge, or using the handy vacuum sealed envelopes is all the precaution needed. Sometimes, if you’re using yeast from a block of yeast, or you aren’t certain about your yeast, you will need to “prove” the yeast. Add your yeast to a tablespoon of water and some form of food for it, mostly sugar but flour will do. After ten minutes, it should be foamy and have grown. The yeast is good and can be added to the flour for bread. One thing to remember about yeast is salt is a killer. Salt is added to bread recipes for two reasons. First, to add flavor, and second, to control the rise of the yeast. Loads of other ingredients are added to bread recipes to make them richer, or slightly sweeter, etc. but I suggest mastering the basic white bread recipe before moving on. Mix 3 1/2 cups flour with the sugar, salt, shortening, and yeast in a large bowl. Add the water and beat either by hand or with a handheld mixer. If you have a stand mixer, that’s even better! Beat on low for one minute, scraping the bowl often. Increase speed to medium for another minute, remembering to scrape the bowl. Stir in enough flour, one cup at a time to make the dough easy to handle. You might use all the flour and you might not. Turn dough onto a lightly floured surface and knead for about ten minutes, until the dough is smooth and elastic. Place dough in a large greased bowl, then turn so greased side is up. Cover and let rise in a warm, draft free place until the dough has doubled, anywhere from 40-60 minutes. (One trick I’ve learned is your oven will work wonderfully as long as it’s NOT ON.) The dough is ready if you touch it firmly and the indentation remains. Grease two loaf pans with baking spray. Punch down your dough (that’s the fun part) and divide in half. Flatten each piece of dough by hand or with a rolling pin to a rectangle 18″x9″. Fold crosswise into thirds, then roll out to a 9×9 square. Roll the dough tightly and seal the ends by pressing with the side of your hand. Fold the ends under and place in a loaf pan seam side down. Brush the top with butter and let rise again until doubled, anywhere from 30-60 minutes. Heat your oven to 425, and place rack so the top of the loaf will be in the center. Place loaf in pan in the oven and bake for 25 to 30 minutes. The loaves should be a deep golden brown and sound hollow when you tap them. Remove from oven and pan immediately and place on wire rack to cool. I also cover with a clean dish towel to avoid uneven cooling. Try not to eat these hot or warm. Part of what will give the loaves stability is allow the steam in the loaf to escape gradually. Over the last several days, Partner/Spouse and I have been cleaning and rearranging the house. One of those tasks is again culling our books, thinning them out so we have more space. This time, though, we’re not donating. We’re putting them in boxes and taking them to storage. I was going through the cookbooks and I notice a decided trend in their titles, after I’d blown the dust off them, of course. This is the desert, after all. I, or we, tend to gather cookbooks that are “specialty” books. For instance, there are three dedicated to rice. We have a bunch dedicated to cakes; two of those are dedicated to chocolate cake only. Some are full size books while others are just pamphlet style you can pick up at national parks, diners, and specialty stores. Loads are of the “church supper” variety. A significant portion of our books are about “old fashioned” or “old timey” remedies. My mom started that interest in me. She used to read about home cures remembering how her mom used them on her and her sibs. She reconnected with her family, and her heritage when she read the recipes or cures. She’d giggle sometimes, laughing at the thought of using those cures. “They worked,” she usually said when I asked why. So now, we have several of those kinds of books. There’s a certain home-spun honesty about the ways people tried to take care of themselves in days before ambulances and ERs on every corner. Not just themselves, either. We have more than a few books/pamphlets on doggy first aid. So I thought I’d share some of the gems of wisdom gleaned from these pages. How to give your cat a bath – I won’t go into it, but suffice to say the major piece of advice is CAREFULLY. Hash – chop up real small one potato per person and cook on a hot skillet until almost tender. Cut up whatever meat is at hand real small. Add to potatoes with maybe an onion and cook, stirring often. Add butter if things stick to pan. When done, serve hot, with maybe a fried egg. Well, that’s about all I got for today. Hope you liked it as much as I did.